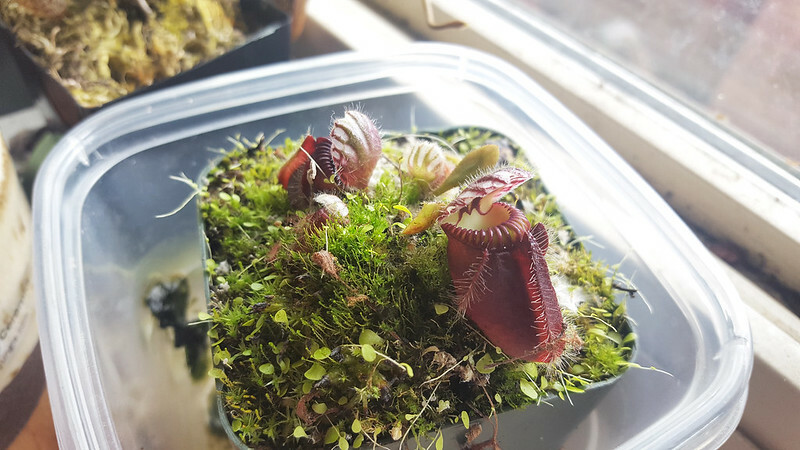 If you've followed my blog for very long, you know that most of my personal carnivorous plant growing has been of the indoor, artificial light variety. Since I've been working at Predatory Plants I've also gotten a decent amount of experience at greenhouse growing. However, for most people, the easiest way to start growing carnivorous plants is in a sunny windowsill. There are also quite a few growers with very impressive windowsill collections. So here's what's been going on in my kitchen lately! 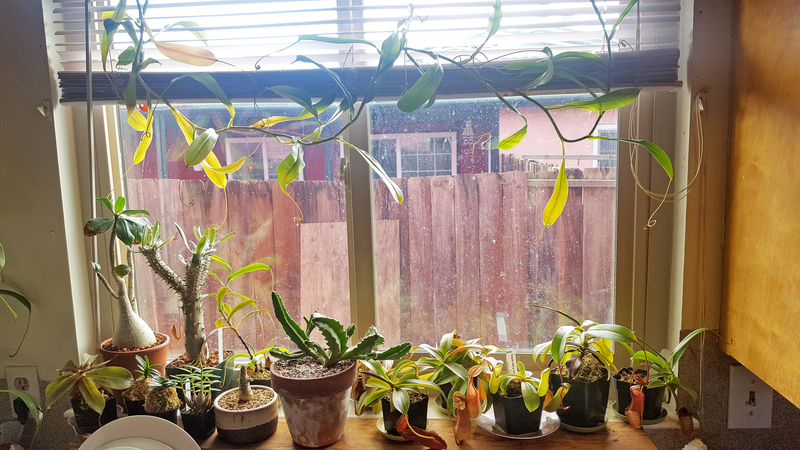 We expanded the windowsill so we could fit more plants into it. As you can see, not everything there is carnivorous. On the left I've got an Adenium obesum I really like. 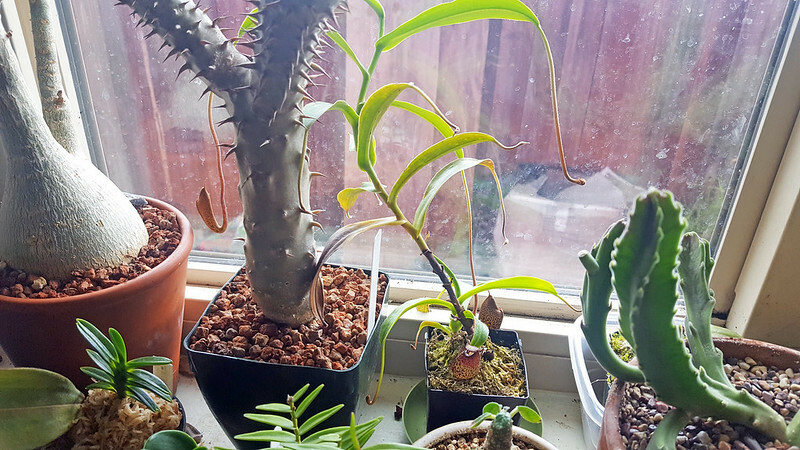 My roommate also has a pretty sweet Pachypodium sp., and we've got a couple orchids and stapeliads. But to hell with that! The fiddliest species I grow currently is Nepenthes spectabilis "giant"
I've waited so long for this pitcher. Josh gave me this almost a year ago, in April 2016. It came with two lovely pitchers, but those were dropped as soon as it went into my windowsill. This most recent pitcher opened maybe 2 weeks ago, which means I kept it around for 9 months with no pitchers. In the plant's defense, I was pretty bad at watering until a month or two ago. It's been doing pretty well lately. 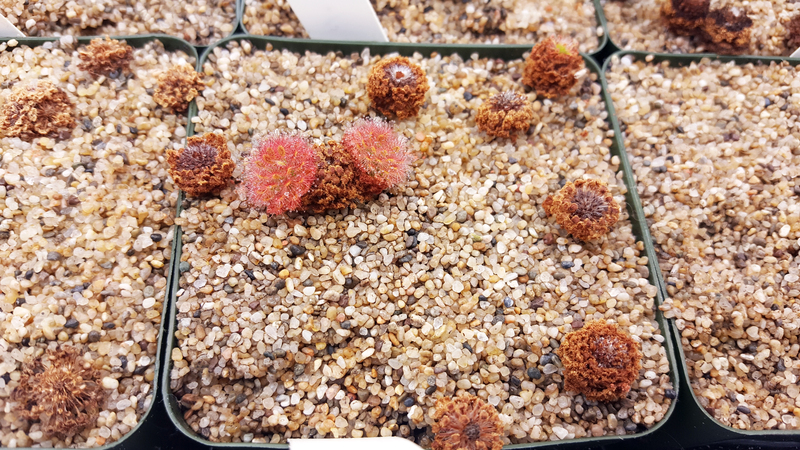 Another plant that gave me problems at first but turned out to be totally great is this N. spectablis × aristolochioides. I got this one in October 2015 as a basal from our big breeding plant at Predatory Plants. It was cute enough, but it also dropped its pitchers and just vined for months and months. 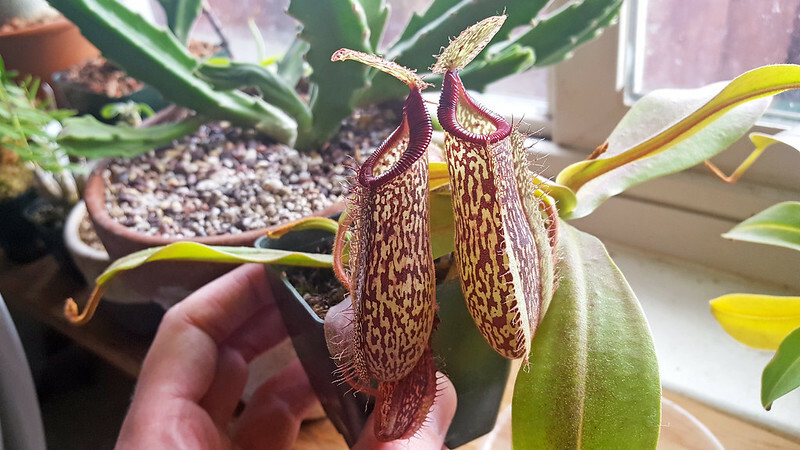 I was rewarded with a really great pitcher in early autumn 2016 that lasted for month and months. Of course, I didn't really photograph it. Suffice to say, people liked it. 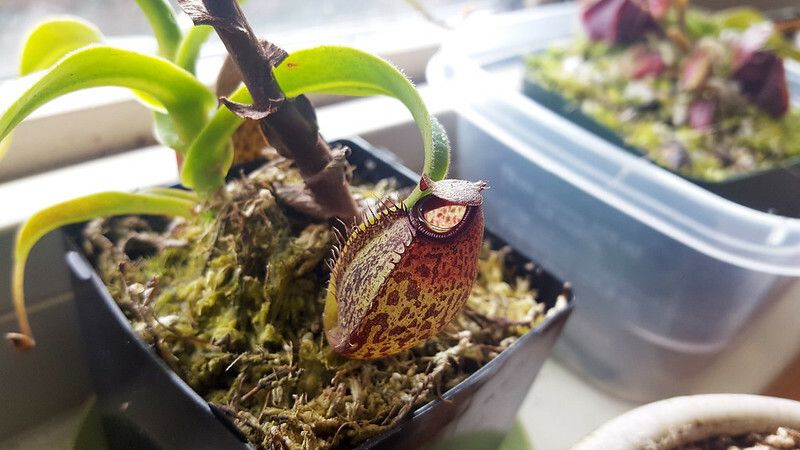 Now though, the plant is doing great – the vine has two pitchers swelling, and the basal is doing great, including popping a cute new pitcher. Probably one of the better aristo pitchers. This has really put on a lot of biomass since I first got it. I'm going to need to repot it soon. I'm super into this plant of late! For the longest time this would only hold one pitcher at once. Then it grew a really strong basal and totally took off this autumn. For the last month and change there were 4 active pitchers, and it just looked great. I think this one really preferred the cooler temperatures and brighter light in winter. The light is brighter because in a south-facing window there are more hours of direct sun in winter, when the sun is lower in the sky. We'll see how this does in summer. My favorite windowsill plant is N. khasiana. This is one of those plants that very rare, but not that desirable, so it's not too expensive. After a few weird leaves early on this one has been really doing great for me. 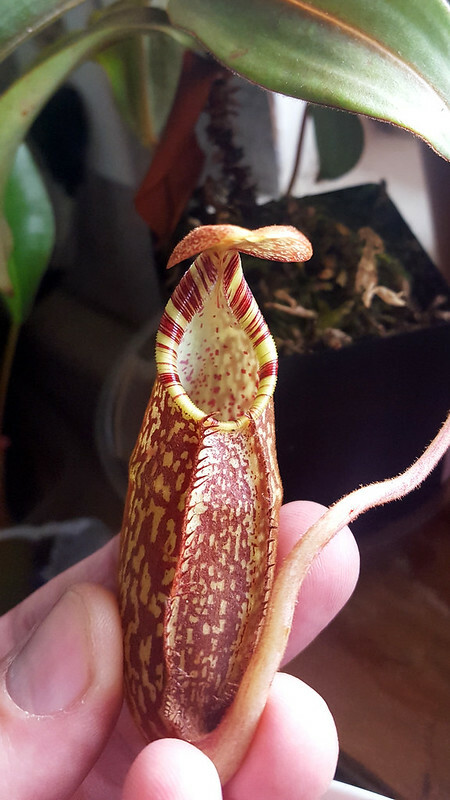 It even held its pitchers during winter, when they'd normally die off. The most recent leaves are a bit small, but I expect it'll do great during summer. Since working at Predatory Plants I've come to really like green pitchers with odd shapes, which this has. My friend Amir says I'm a Nepenthes hipster. It's not only Neps that grow in my windowsill though! Amir gave me a Cephalotus some time ago, and again I didn't document it well. Initially it was small, with immature pitchers. I've kept it in my windowsill and it's doing great! This is a very nice clone with lots of red coloration. I keep it in this tupperware, which I fill with water after letting it go dry for a couple days. 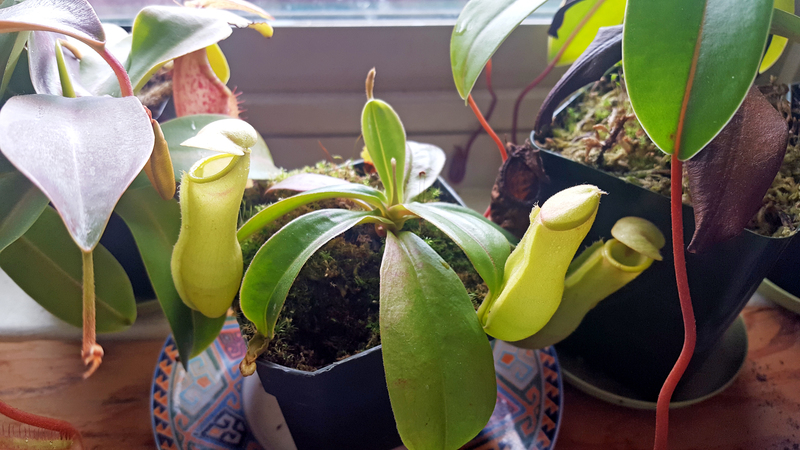 I put some Osmocote fertilizer in one of the small pitchers once, but its been really hands-off otherwise. That's Utricularia sandersonii in the pot, but it hasn't bloomed in months (probably too dry). Whoever said Cephs are hard to grow? Speaking of Amir, you should go check out his blog, www.thesundew.blog (I helped him workshop the URL). 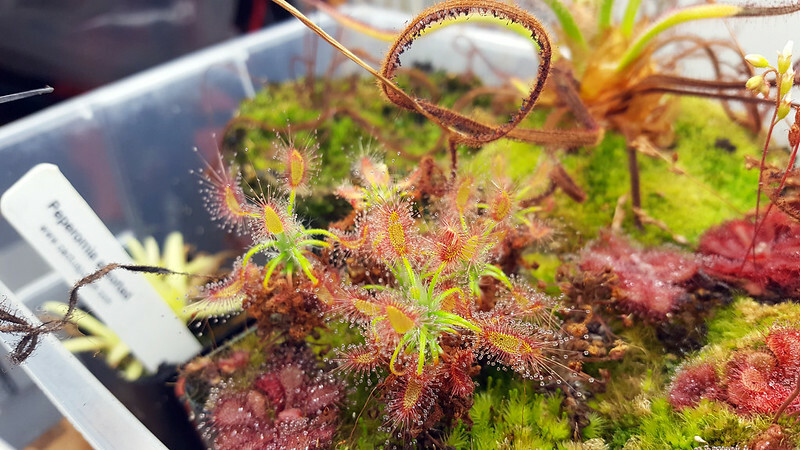 Amir bought some Drosera burmannii seeds from me a little over 2 years ago, when he was first getting started with carnivorous plants. 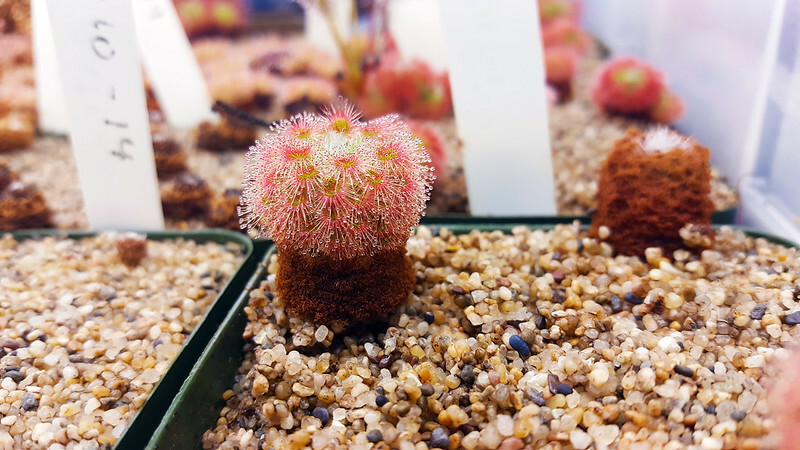 Since then he's become quite a formidable indoor grower, with an impressive collection of Drosera and rare Cephalotus. 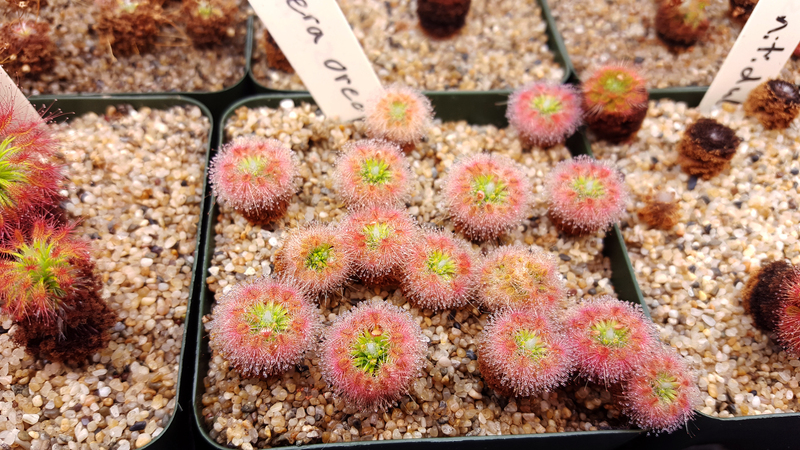 His blog has great pictures, and he grows a lot of plants I don't have, so it's worth examining. 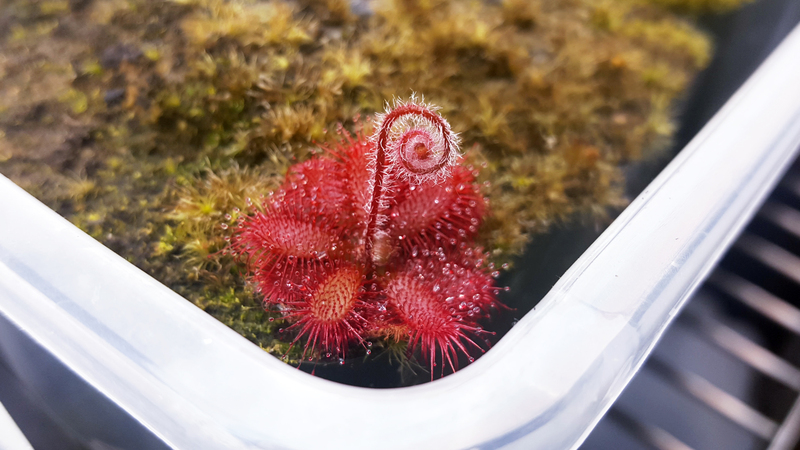 Here's a Drosera regia he grew from seed and gave to me a couple months ago. Isn't that great? Go look at his blog, especially since I seem to have become so bad at posting regularly. There's a lovely surprise in the collection right now. Between the fuzzy stalk and the chubby leaves it's much too cute. It's Drosera tomentosa! 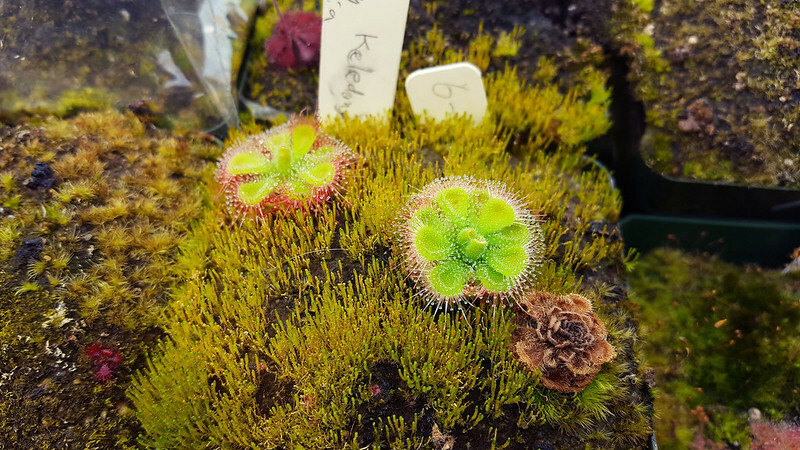 This is an adorable little sundew from South America with fuzzy little flower stalk. The cuteness of this flower stalk was so overwhelming that it spurred me to make a post. So uh, here are some other plants around the collection. 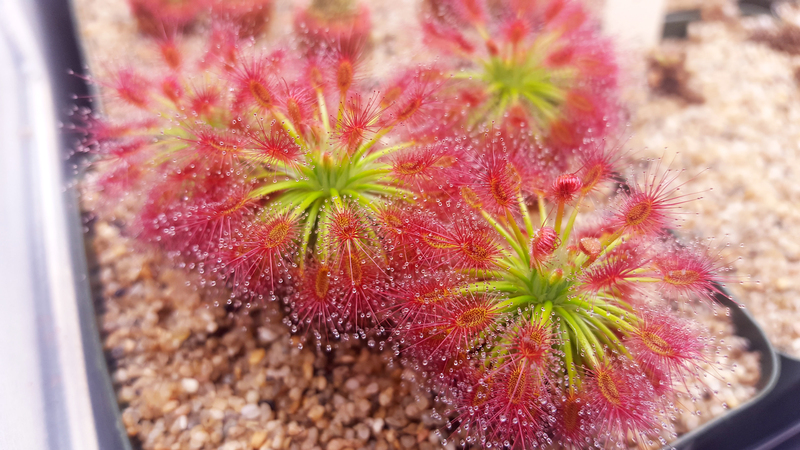 Drosera barbigera looks the best of any of the pygmies right now. 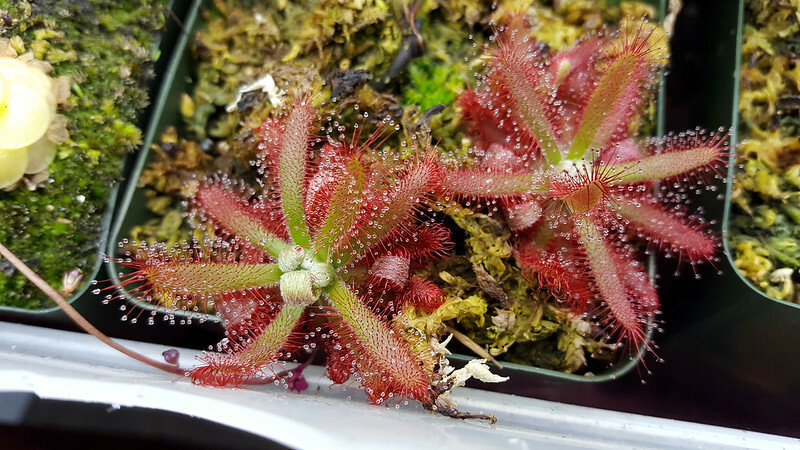 Drosera zigzagia came back even though I didn't give it a proper dry dormancy. This one is actually Byblis liniflora, for sure. 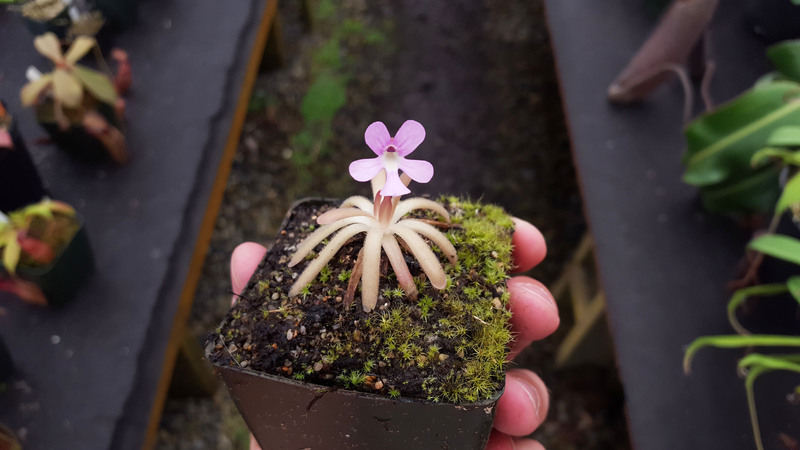 Pinguicula esseriana is cute, but really slow-growing. 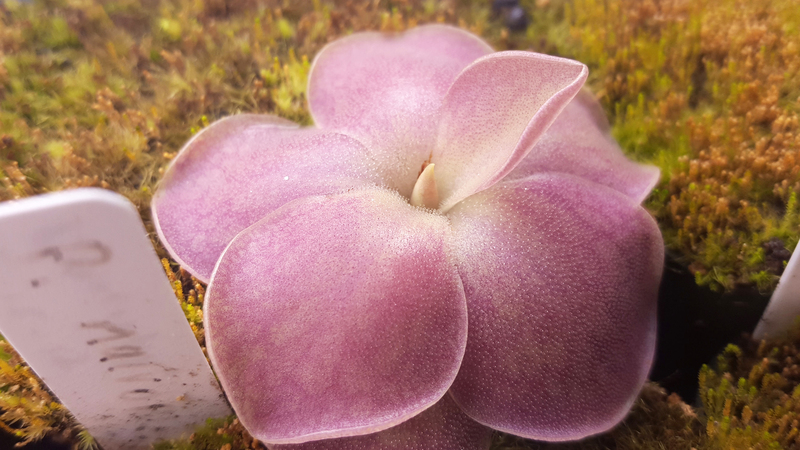 I love the faint venation on this Pinguicula hemiepiphytica. 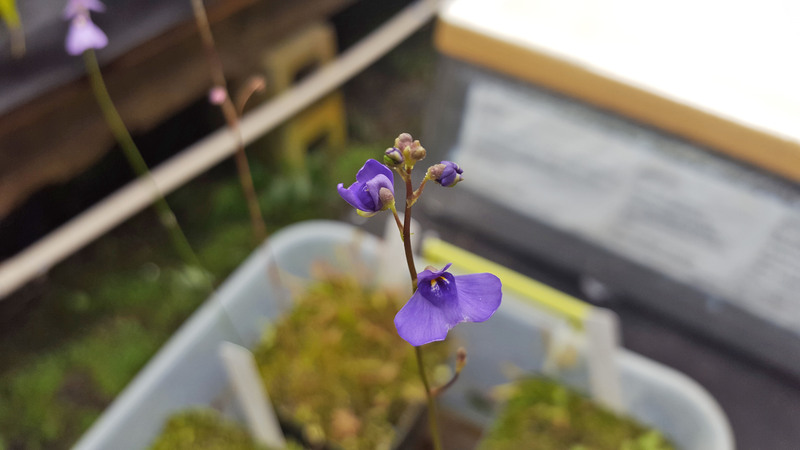 Finally got some new flowers on my Utricularia sandersonii blue form. Of course, most of the plants I deal with now are in the greenhouses at work. They're also cool! 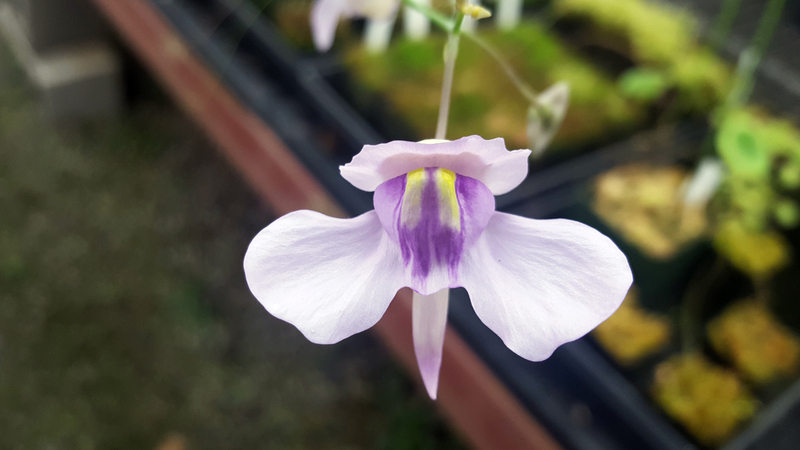 Our Utricularia nelumbifolia has bloomed! Funny eyeball flowers. 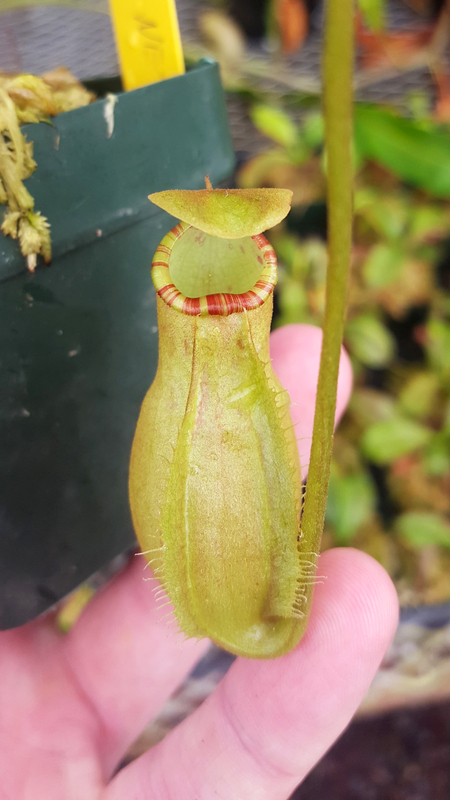 Nepenthes sumatrana is very cute. Love that stripey peristome. 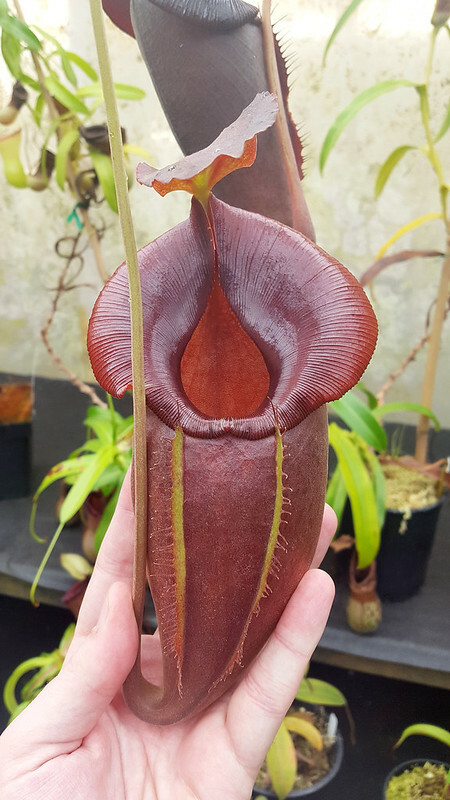 This Nepenthes (ventricosa × sibuyanensis) × merrilliana has hilarious proportions. 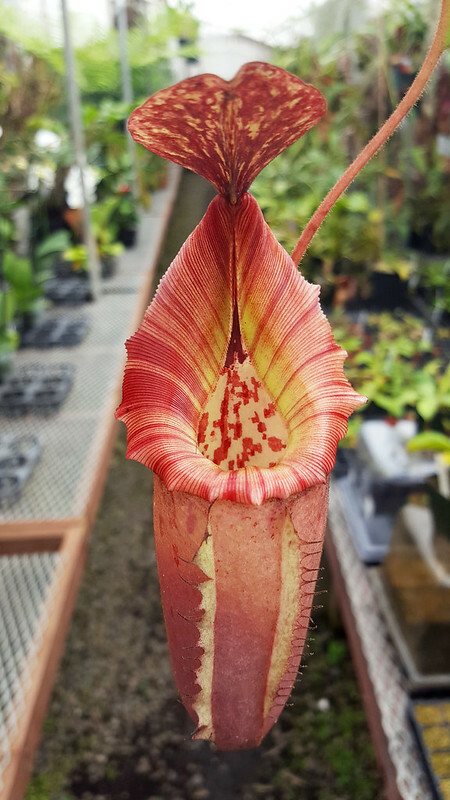 A wonderful pitcher on Nepenthes ×tiveyi "Red Queen". This is probably the best N. ×tiveyi. This is our select clone of Nepenthes spathulata × jacquelineae. You can probably see why. 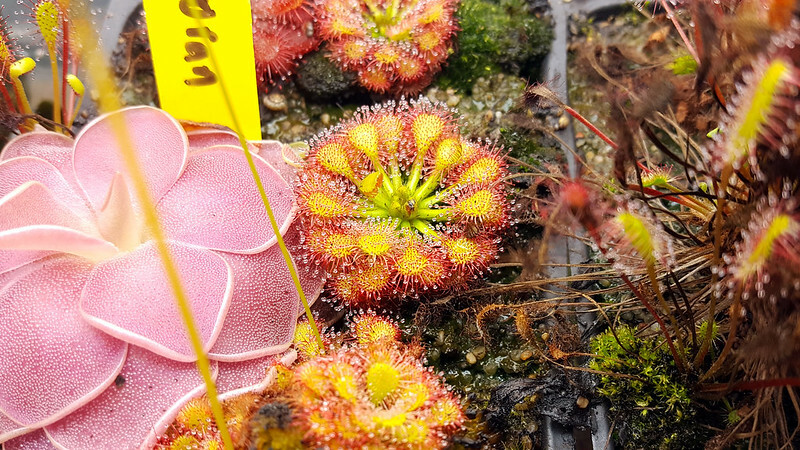 And just think, this whole blog post was because of that one little sundew. I wanted to do a quick little post about my pygmies. Then I took too many pictures, so I'm going to keep it pretty heavy on pictures and light on commentary. 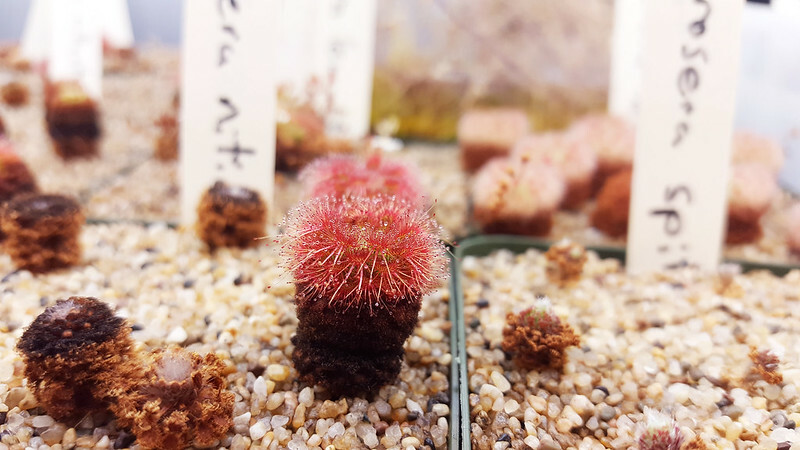 I've been wanting to make a pygmy post for a while, since they're one of my favorite groups of plants, and I want people to understand them better. Pygmies are short-lived perennials – it's a rare pygmy that makes it to 5 years old. In general I've noticed around 30% attrition annually in my pots. What that means, of course, is that the conscientious collector will propagate from gemmae every year. Now, not all pygmies make gemmae every year in all conditions, but last year I didn't do any personal propagation. As a result, my collection is looking a bit iffy heading into gemmae season. 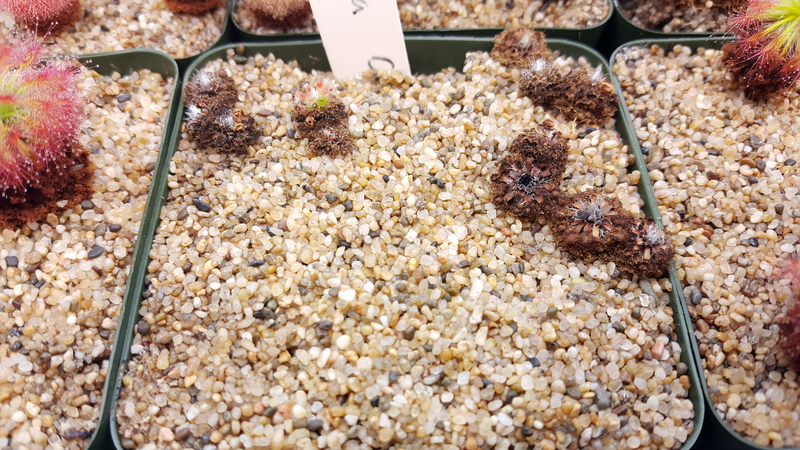 Drosera pygmaea never liked me anyway. I think Drosera pulchella also got aphids. Drosera roseana burned too bright. Drosera spilos actually just always looks bad for me. Other pots are looking almost perfect. 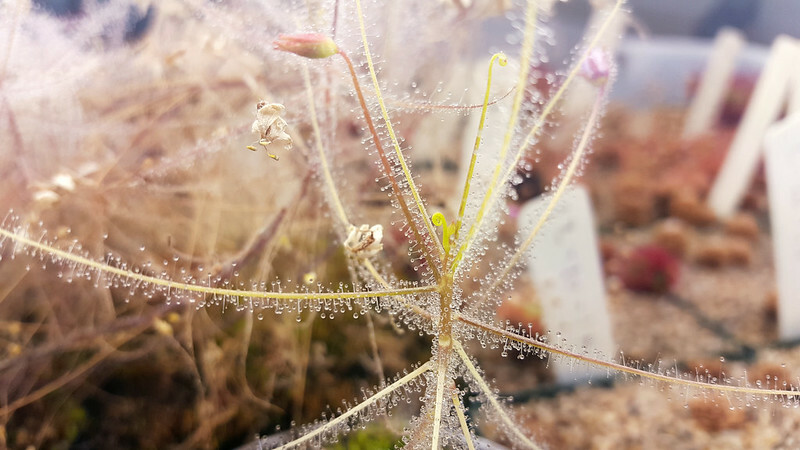 There don't seem to be any broad trends in terms of what has done well and what hasn't – pygmy sundews are all quite specialized, and you may see totally different results in your culture. Drosera callistos Brookton is a hero. 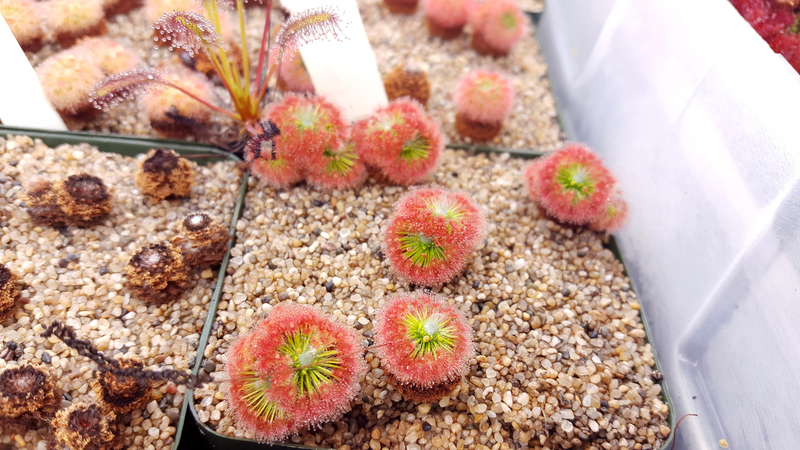 Drosera helodes has performed quite well over all as well. 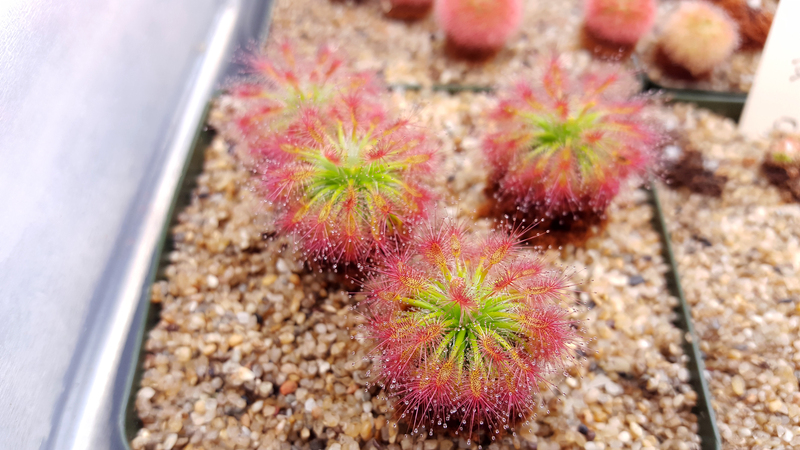 These Drosera scorpioides are a year older than everything else and they're still pretty decent. 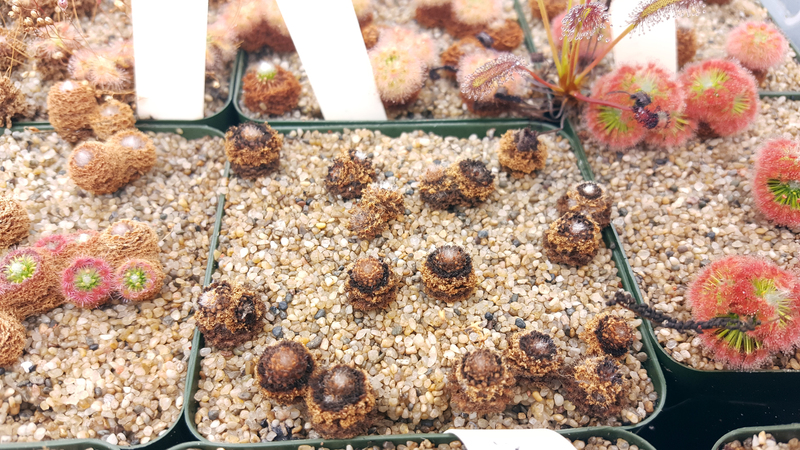 Looks like Drosera sargentii either split their growth tips or I failed to harvest all the gemmae. 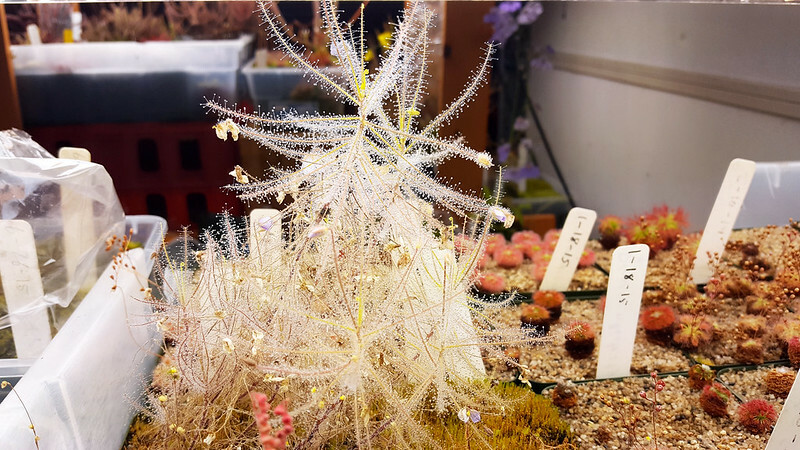 Drosera barbigera are absolutely wonderful. One of the things that's hard to tell with a top-down photo is that several of these species have developed significant stems. Consider the above D. barbigera from another angle. It's even more dramatic in a couple other species. Drosera dichrosepala growing in a tiny pot. 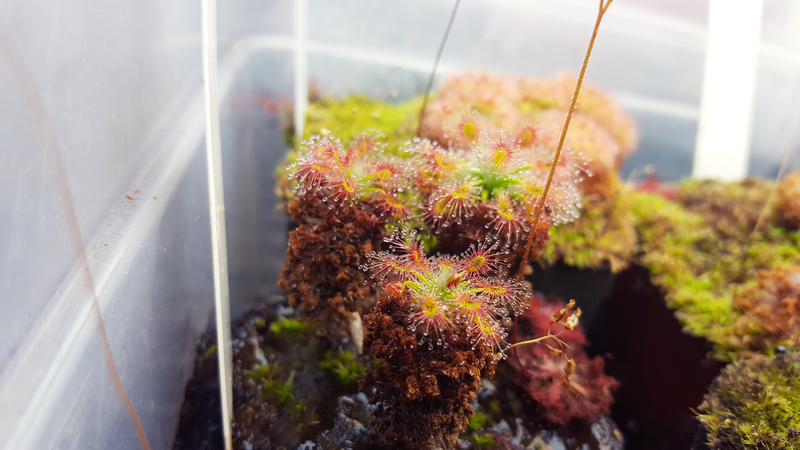 One of the few surviving Drosera nitidula. 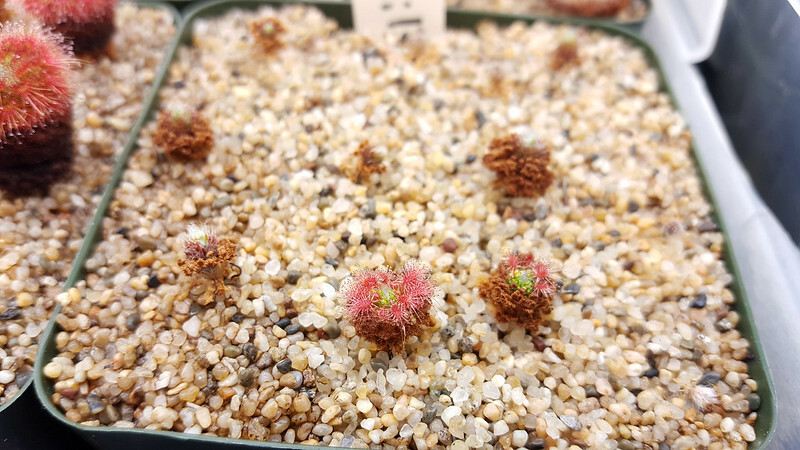 Looking great, Drosera ×Dork's Pink! The stems are quite interesting, and I'm curious to see how long the plants will keep going. However, this next year I'm going to do a full reset on my pygmy pots so I don't lose any more species. Luckily, I've shared gemmae with friends, and I also sold quite a lot last year, so hopefully I should be able to restock on what I've lost. Always share your propagules! Hahahah okay let's just admit that I'm probably not going to make 17 posts in a month again (like I did back in April '14) any time soon. Okay well, that established let's see what photos have been languishing on my phone not being posted anywhere. 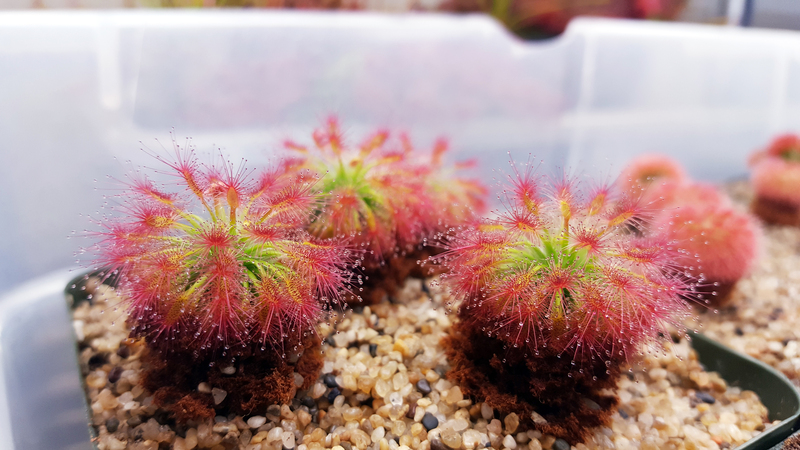 Drosera binata 'Marston Dragon' looked pretty nuts back on July 31st. I wonder what the total volume of that dew is. Probably an ounce or two. I still have no idea what I'm supposed to do with this plant. At least it looks rad as heck. Fair warning, since I'm gonna be using pictures I've taken at work a fair amount, there are gonna be more neps than there have been on the blog in the past. 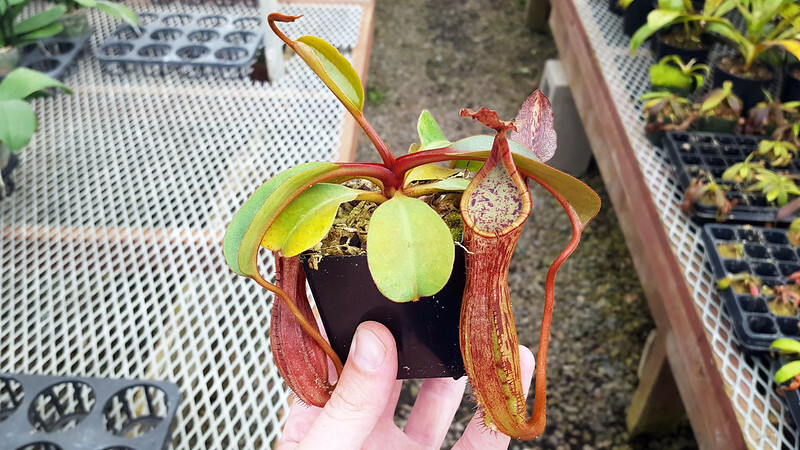 Considering this Nepenthes eymae × jacquelineae though, can you blame me? I really like the glaucous character of the pitcher body. This is a freshly-opened pitcher on what is probably my 4th favorite nep in the greenhouse (please don't ask me what the top 3 are, I have no idea). Wowzer! 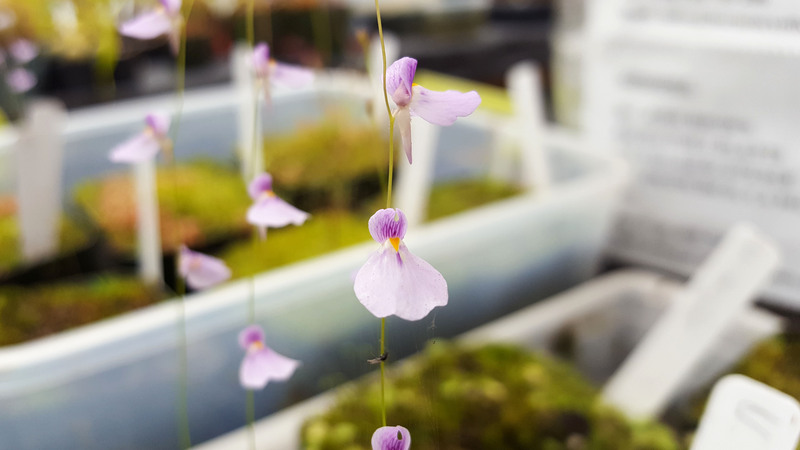 Don't worry though, there are also utrics at the greenhouse, such at this Utricularia blanchetii. This is probably the most floriferous of the new little terrestrials I've been messing with lately. It's also completely adorable! And at home, I still have sundews, even if I'm barely able to rouse myself to water them properly. 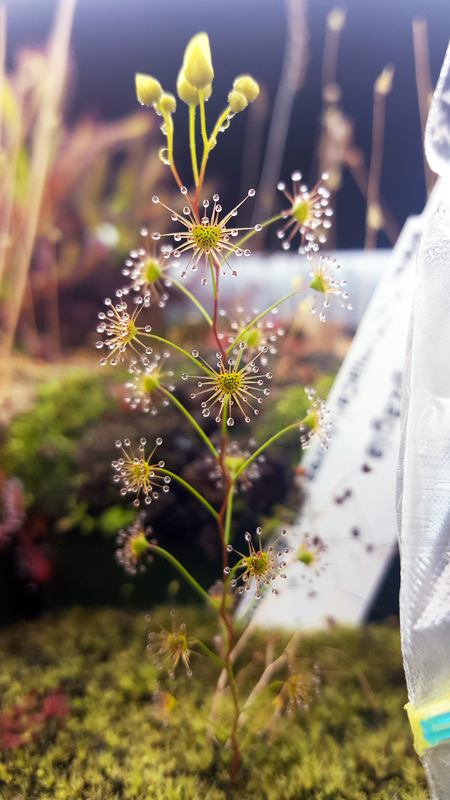 Here's my Drosera kaieteurensis starting a new flower stalk. Note that I didn't refer to it as Drosera felix. 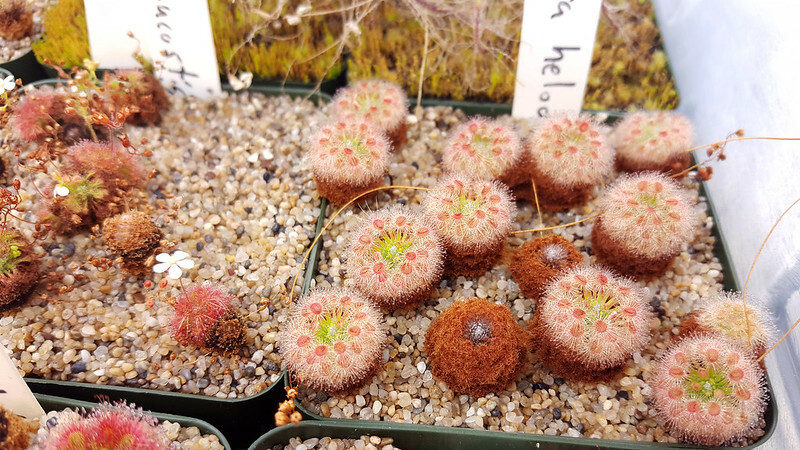 That because when I showed photos of it to Fernando Rivadavia he was unequivocal that the fuzzy flower stalk indicated D. kaieteurensis. He had no strong opinions about the purported synonymy of the two taxa, but insisted that if the flower stalk was fuzzy it couldn't be D. felix. So there. Another South American sundew with a difficult-to-spell toponym for its specific epithet is Drosera graomogolensis. It's also a total beast in spite of all my neglect. This is an extravagant plant. Root cuttings are an awesome way to get big plants fast, especially if it's one of the species with big fat roots. Great stuff! 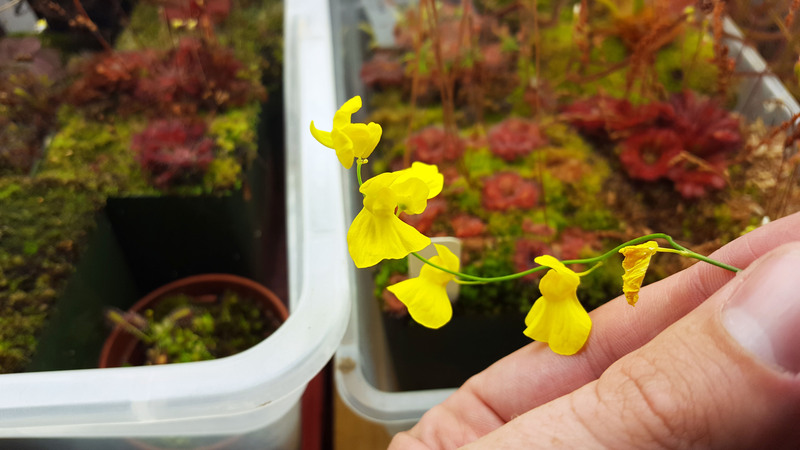 Another utric that I'm super stoked about is Utricularia biloba, which opened its first flowers for me a week or so ago. These also have a neat chubby spur that's bright green. As others have said of this species, photos don't do justice to the color, which is a deep violet with a hazy blue depth to it. Weirdly, the blue comes out more for me if I blink rapidly while looking at the flowers. Super interesting plant! Thanks Howard! 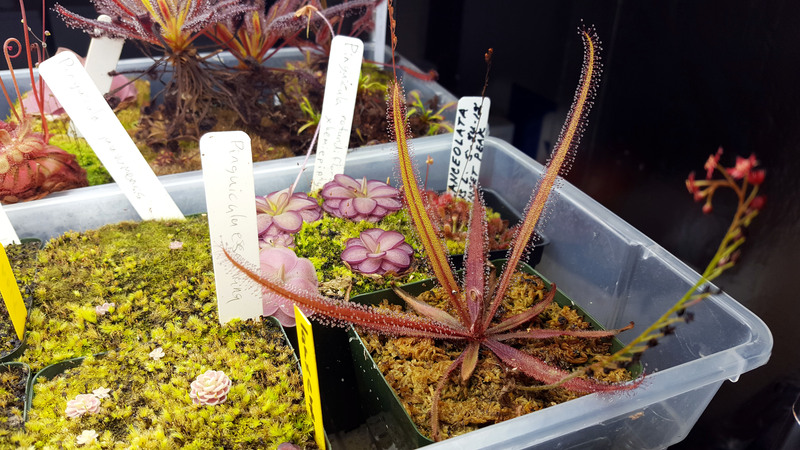 Finally, I've been selling select plants on Facebook – one-off neps, as well as new items like utrics and sundews that aren't in huge production yet. 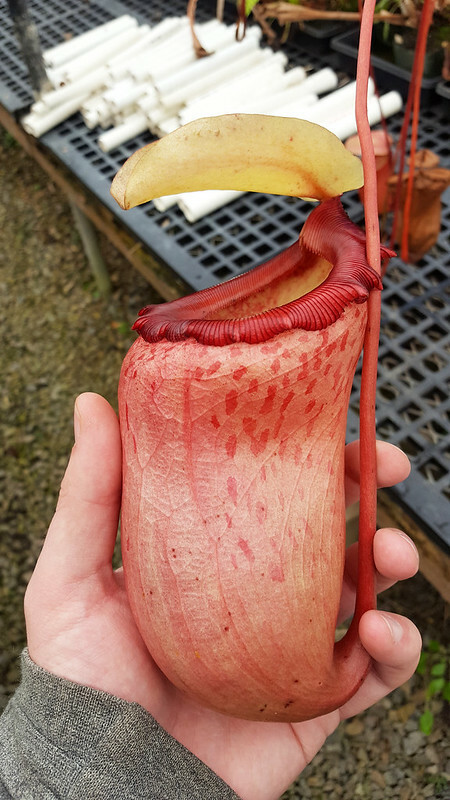 This Nepenthes fusca sold almost immediately this morning. I can't imagine why. I wish we had way more of this species than we currently do. It's wonderful! Anyway, those are some plants. They're pretty cool. Hi everybody, this post is mostly about me, rather than the plants, which is not what I usually like to post about. Don't worry though, I've got some pictures of some of my plants to spruce things up! First of all, I'm about to head to the ICPS Conference in London! I'm very excited to go meet other weird obsessives from around the globe. 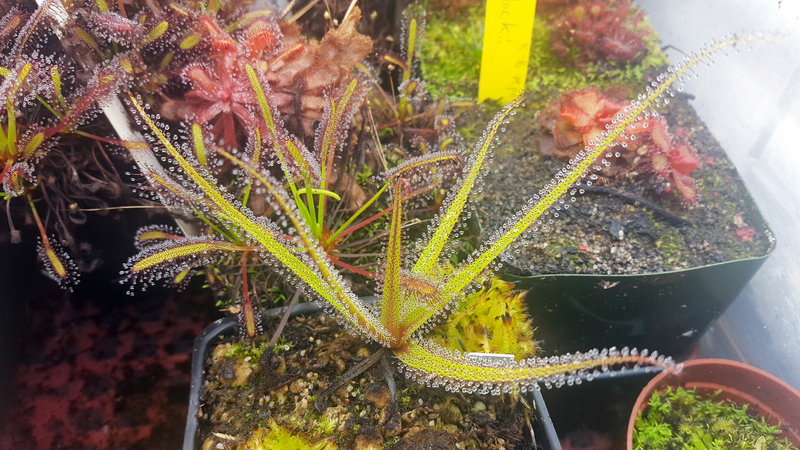 The Drosera graomogolensis look rad as heck right now. I'll be in London next weekend for the conference, and then my girlfriend and I are going to spend a week in Germany futzing about for the hell of it. I'm quite excited, and will make sure to take pictures/video of the event. My great dream is a selfie with Sir David Attenborough, but we'll have to see. The second bit of news is a bit bigger, and is part of the reason that I've been posting somewhat less frequently in the last several months. 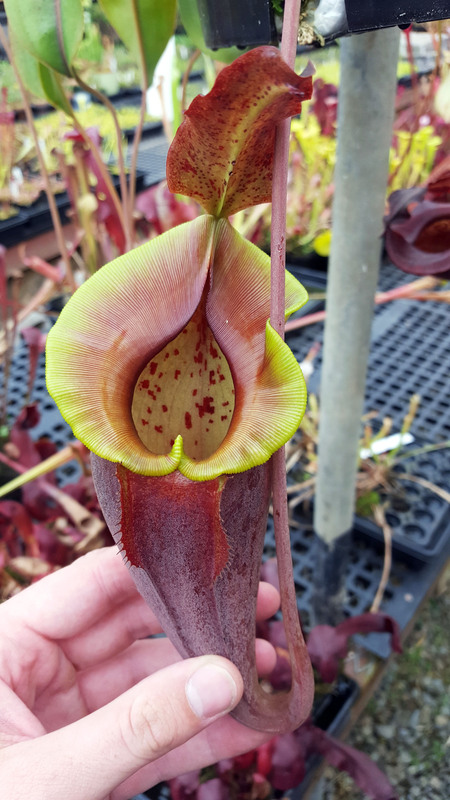 I'm now a carnivorous plant professional working at Predatory Plants! 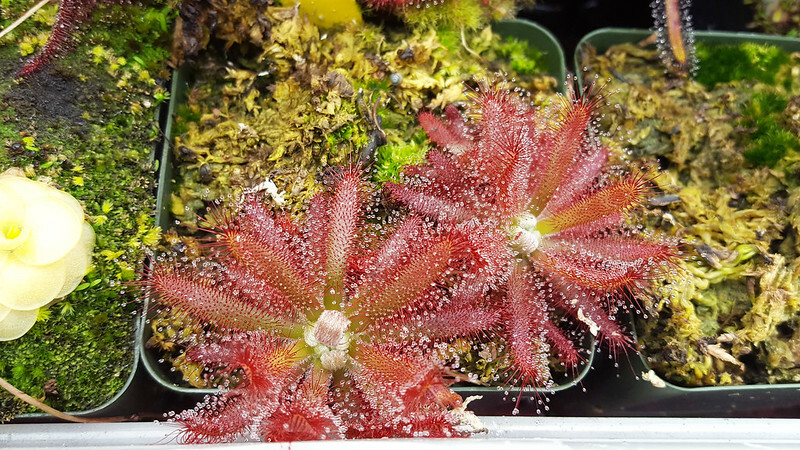 Drosera burmannii Gunung Keledang look very alien and cool. Specifically, I'm the Director of Retail Operations, which means I do online order fulfillment, work the plant show circuit, and do propagation and greenhouse work whenever I can find a spare second. Basically I now think about plants all day long, almost to the exclusion of other concerns. 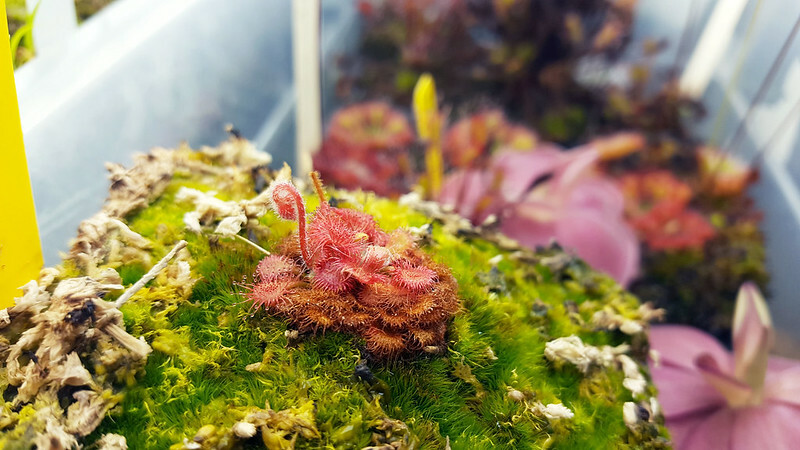 It's very exciting – and very, very unexpected – to have begun something of a career in carnivorous plants, especially considering I bought my first Drosera capensis less than 3 years ago. 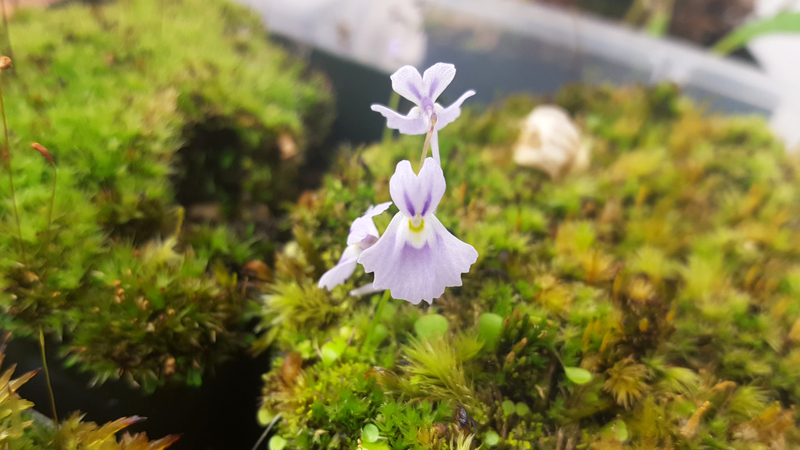 Utricularia praelonga still blooming up a storm. In point of fact, I've been working at Predatory Plants since November. At first it was part time (after I left my last job), and then it became full time, but it wasn't clear that it would be a permanent position. Luckily, things have been going quite well in expanding the business, and well here we are. My family is deeply confused about what my life has become. 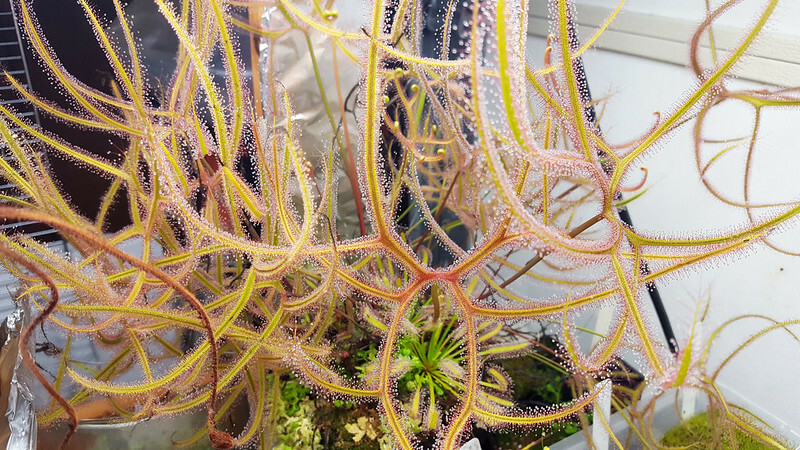 This is Drosera adelae Giant form, and it's actually genuinely giant. Wow! What does this mean for the blog and Instagram? Well, I might not post quite as often, if only because after a long day in a hot greenhouse I can barely manage to keep my personal plants watered, much less documented and blogged about. However, now that everything's all official I'll be able to post about work stuff as well, some of which is quite cool. I'm still trading and selling my own seeds and gemmae, but I may occasionally post links to fun stuff that we're selling on our website. 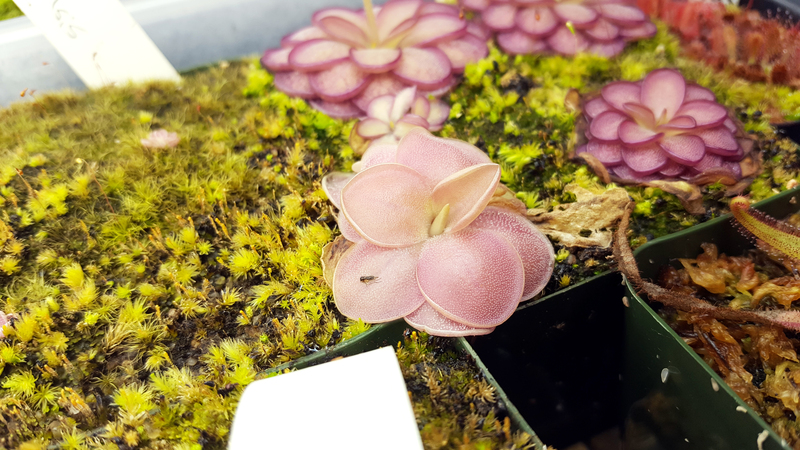 The unspeakably adorable Pinguicula gypsicola × moctezumae at work. Thanks to all of you who read the blog, and who have commented and emailed about how much you enjoy it. 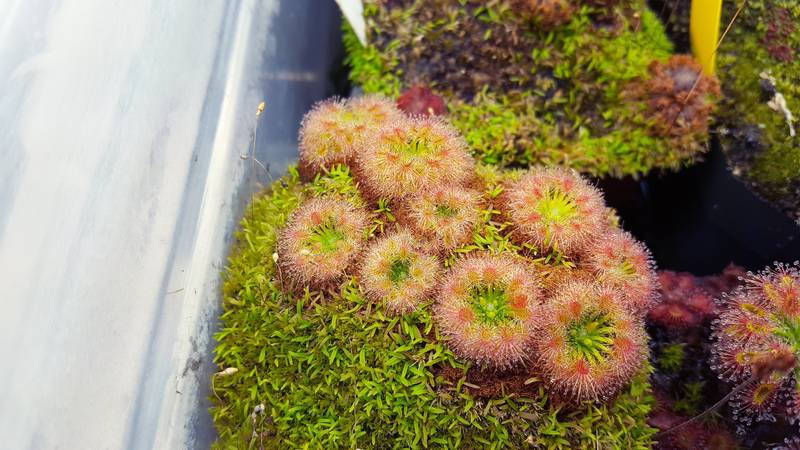 I had been in a bit of a post-college slump/depression for a bit when I started collecting sundews, and then started blogging about it. It really got me out of my funk, and now it's gotten me a very strange and fun job. Life is very weird and cool! So are carnivorous plants, I guess. This weekend my friend Amir came over to see my collection. He was quite taken with the plant I've been referring to as Byblis liniflora, in part because it's a lovely plant, but also because he grows B. liniflora and mine looked nothing like his. What a lovely plant. So delicate! Later that evening he sent me some texts suggesting – very convincingly – that I was actually growing Byblis rorida. From growth habit to color to flower shape, it seems pretty clear that I had gotten my seeds with an incorrect ID. 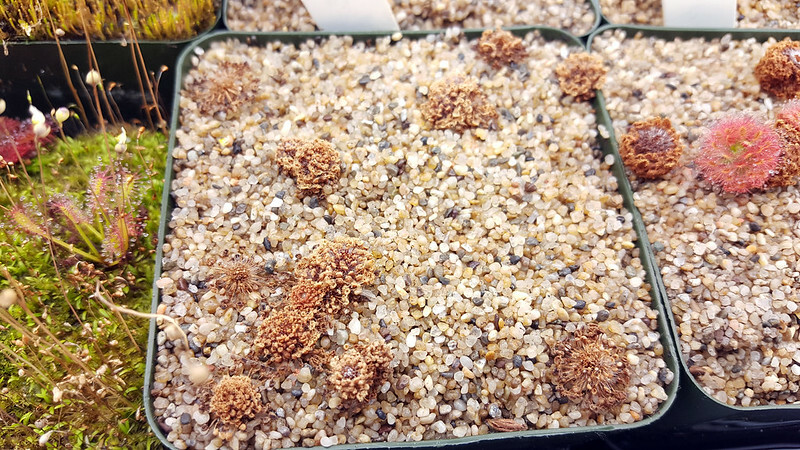 Luckily B. rorida isn't really self-fertile (like B. liniflora), or I might have distributed seed incorrectly as well. I also recently flowered a plant that I've known for a couple years as Pinguicula rotundiflora × hemiepiphytica. There have been some stirrings lately that this is probably an incorrect ID, and this flower pretty much confirms it for me. This flower is very clear in my mind. 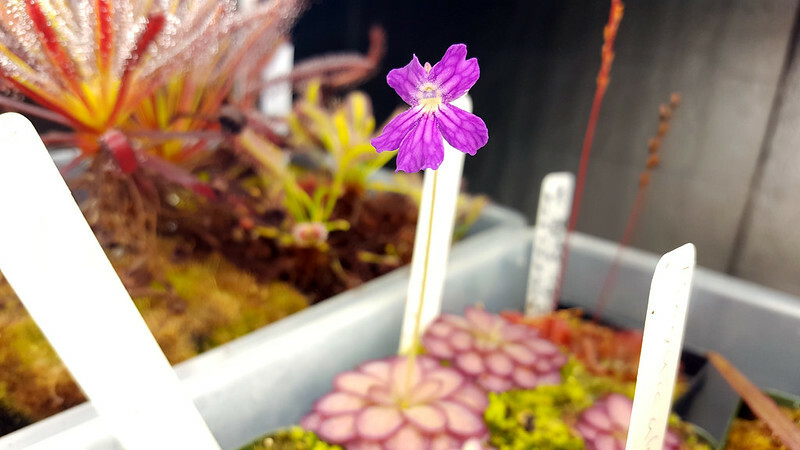 The argument is that this plant is actually Pinguicula laueana × emarginata, and this flower seals the deal. There's no hint of Pinguicula rotundiflora anywhere in this plant, and this flower both looks intermediate to Pinguicula laueana and Pinguicula emarginata, and a great deal like the ping I have that came identified as a hybrid of such. It's good to know I guess! In that same pot I placed a leaf I received as the same hybrid. It is clearly not. 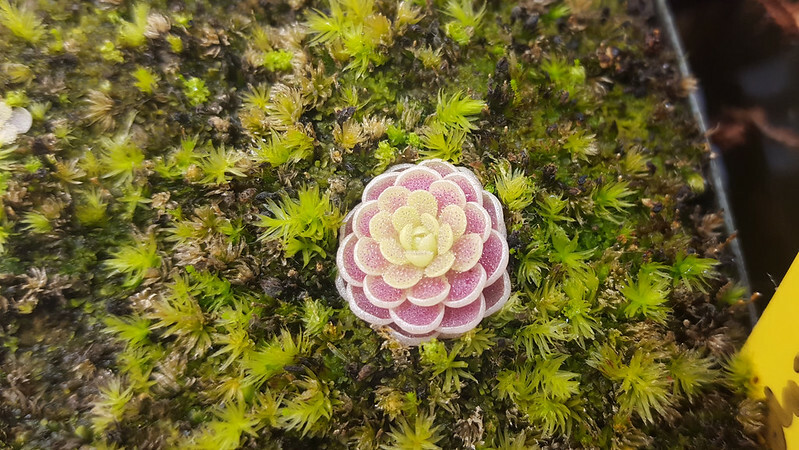 I don't know what it is, so I assume it's a Pinguicula moranensis (hah). I basically need to flower this plant to have any idea what it is, and even then a diagnosis is going to be tough. I'll probably give this one away to someone who doesn't know about carnivorous plants and won't care about the ID. How does stuff like this happen? Partly because plant IDs are mostly a loooooong game of telephone, especially for plants that primarily circulate in the hobby through trading, rather than by being produced in nurseries. Very few hobbyists actually have the training to go read a species description, analyze some herbarium specimens, and make an independent ID. Changing labels can be very risky, since sometimes plants can look very different in different conditions. Generally I think people should keep the tags they received unless they're very very confident in changing them. That can just introduce more problems into people's labels. Some of you who have read the blog may remember when I "rediscovered" a cultivar called Drosera capillaris 'Emerald's Envy'. It's one of my favorite plants! It's so pretty and jewel-like. What a nice plant! I did a lot of work before I felt comfortable changing the labels. I tracked down a couple different rumors I'd heard, and even reached out to the person who wrote the cultivar and tried to trace my plants to him (I couldn't quite draw the line all the way, but he felt that my plants matched the ones he wrote up years ago). I'm glad I did the work, because it's nice having a cultivar designation to go along with a nice plant. I know I'm getting a bit crazy when I'm considering buying monographs to see if I can independently key out difficult species in my cultivation. I guess that's the way these things end up.